NEW Emailing List. Subscribe Now! (We have totally scrapped our old list, and are now using a new, steamlined list that will allow you to subscribe and unsubscribe more easily.) Click here to get on the new list now! If you are getting our emails and don't want to, you need to click on the link above and follow the remove instructions (there is no way that we can remove your email for you). Get 20% off until June 15th! click the book to order and insert the secret savings code below when you are asked for it! When you're at the Pro Shop, make sure you check out our cool apparel, too. Soapbox: While we're usually all about duct tape and humor, there's a serious side to us, too. We want to challenge our readers to become socially aware and active. This month: CLEAN WATER Click here to see the unique way that Healing Waters International is bringing clean water to developing countries. What To Get Dad for Father's Day? 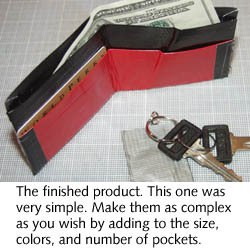 Make dad a duct tape tie or wallet. The tie resists stains from dad's spilling problem like crazy, and the wallet will bring a ton of compliments! We think that you can figure out how to make the tie, but the wallet might be a bit more complicated - so we've posted directions. Click here to go to our how-to page. Remember, duct tape comes in a bunch of colors (and even clear and camoflauge, so there's a color to match dad's personality). Check out the whole Duck® brand pallet of colors and find out where to buy the colored tape at our Retail page. Here's the book that every voting American needs to get educated for this November's election It's another new book from Tim the Duct Tape Guy and his buddy Warren (the Peef Guy) - actually, its authored by 700 kindergartners! We interviewed 700 kindergartners and asked them what the President does. Their answers were innocent, insightful and downright hilarious. So, we put them in a new book: Kids Tell Us: What Does the President Do? You can read excerpts and order it online (or pick up a copy at your favorite book store). It's a great light-hearted alternative to the nasty, heavy political rhetoric that we'll be dealing until the November election. And, as Al Franken says, "It makes a great gift!" Check it out at www.KidsTellUs.com. 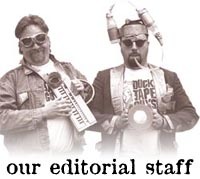 What's new on the duct tape web site? License Honors Dad My Dad was an old school sheet metal mechanic from way back, and Duct tape has been a staple to our existence ever since I can remember. We he passed on, I inherited his pickup truck and had it registered as shown to sort of pay my respects to him. He always had a great sense of humor, especially when it came to Duct tape and was the first to get me one of your calendars a few years ago. Just thought you'd like to see the plate. - Jim S.
While the company was rolling in success stories from the past year at its annual Duck Challenge Day, the three executives were rolling in play money, trying to earn dollars for charities. The executive who “adhered” to the largest amount of dollars won the most for his designated charity. Based on these executives’ results, three charities will receive donations from Henkel Consumer Adhesives. Brogan’s winning collection earned $2,500 for the Boys and Girls Club of Peel, a Canadian branch of the charity. John Kahl earned $1,500 for the Avon, Ohio, school system. Bill Kahl earned $1,000 for the Cleveland-based Esperanza Inc.
Clean Tomatoes My wife and I love home-grown tomatoes. However, I found that birds with loose bowels loved to perch on top of my tomato stakes. It was disgusting to go to the garden to pick some juicy tomatoes for dinner and find them covered with starling excreta. Duct tape to the rescue! I fastened 16d nails (pointed end up!) with duct tape to the top of each of my tomatoes stakes. Now my tomatoes stay clean and the birds get the point that they are not welcome in my garden. - Joe S.
"Duct TapeDad" - Click to the Duct Tape Pro Shop for this and other shirt designs that are perfect for your duct tape lovin' dad (grandpa, husband, brother, uncle, etc.). Remember, dad couldn't be dad without duct tape! Make sure you order by June 15th or we can't ship in time for Father's Day! Remember to enter the code below for a 20% Father's Day Discount (for our newsletter subscribers only). 4) Never ask your 3-year-old brother to hold a tomato. 7) Never hold a Dust Buster and a cat at the same time. 9) Don't wear polka dot underwear under white shorts. 10)The best place to be when you're sad is Grandma's lap. 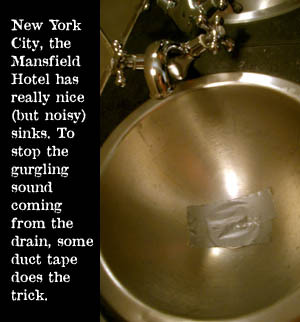 See all of our duct tape sightings from around the world at our duct tape sightings pages. Got some sightings of your own? Don't be shy, send them our way! RANDOM WINNER: The random winner of a duct tape book in this issue: Dan Dankle - Congratulations! 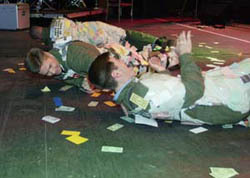 Send us your mailing address and we will send you an autographed Duct Tape Book.